Our curtain shelf brackets feature a pine tree silhouette, and are made of wrought iron. They will support a 1 x 6 shelf and a curtain/drapery rod to create a unique window treatment. The baked-on powder coated finish provides maximum rust protection in humid areas. Sold in pairs only. A center support bracket should be used with rods that are extended more than 60". 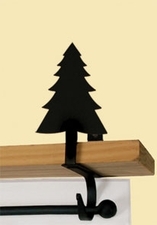 purchased with a qualifying pair of Curtain Shelf Brackets. These American made wrought iron curtain shelf brackets are handcrafted in Fabius, New York, by Village Wrought Iron.